At Saha Global, we believe that access to safe drinking water is one of the biggest challenges of our time. 663 million people around the world lack access to safe drinking water. Water-related diseases, like diarrhea, dysentery and cholera, kill more people every year than all forms of violence, including war. The most vulnerable population are children under the age of five. Despite these seemingly grim statistics, we are confident that our generation can be the one to end the Global Water Crisis. The solutions to this problem exists. Effective, low-cost water treatment technology is widely available – we just need to connect these solutions to the people who need them. That’s where Saha comes in. For the past nine years, Saha has focused our efforts in the Northern Region of Ghana. In 2008, our co-founders, Kate and Vanessa, were conducting their graduate research on the water crisis in this area, where 800,000 people lack access to safe drinking water. People living in rural communities are forced to drink from fecally contaminated surface water sources called dugouts. As a result, 15-25% of children under the age of five are suffering from diarrheal disease (the third leading infectious killer worldwide). 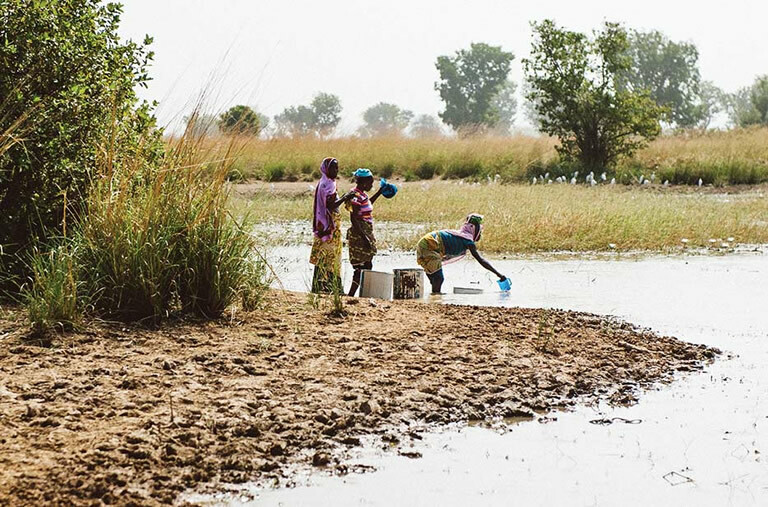 The more that Kate and Vanessa learned about the water needs in Northern Ghana, the more connected and passionate they felt about the impact that they could have. They were surprised to find a wealth of affordable water treatment products available in local markets and realized the key to success was training people who lived in rural communities how to use these technologies. Saha Global trains women in rural communities to solve their village’s need for clean water by providing business opportunities. We partner with communities and train local women to launch profitable social enterprises. All of the revenue from these businesses stays in the community and is managed by the women entrepreneurs. To date, Saha Global has launched 134 clean water businesses which serve over 50,000 and are fraction of cost of drilling a borehole or well. Saha is committed to providing ongoing technical support and mentorship in the communities we work to ensure that the clean water continues to flow.